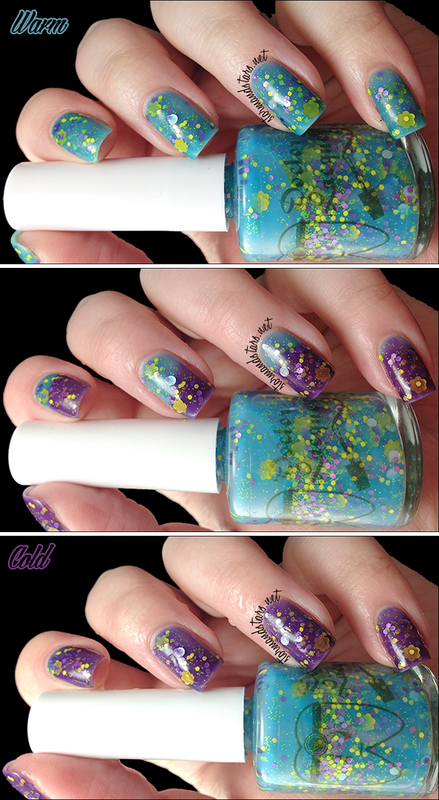 Today I have the third and final installment of the Doctor Lacquers that I received for review. 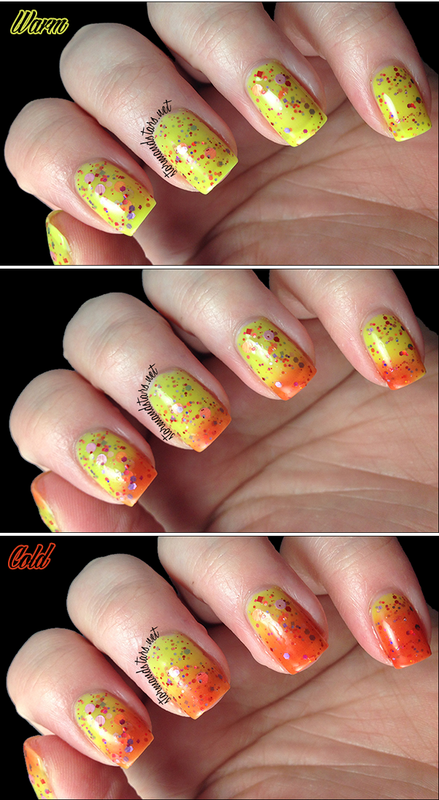 This one is called the Hormonal Efficiency Collection and consists of six thermal lacquers. Three of these lacquers are heat reactive while the other three are cold reactive. I'm going to show you all of them in transition and also in their hot and cold states. All of these lacquers have about the same formula. 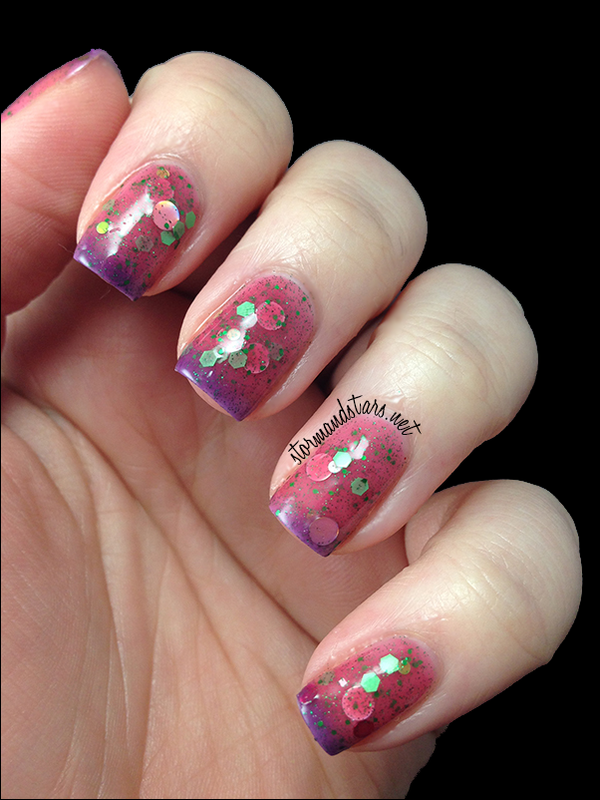 They are jelly-ish and I used three thin coats with Glossy Glam topcoat for all of the swatches. 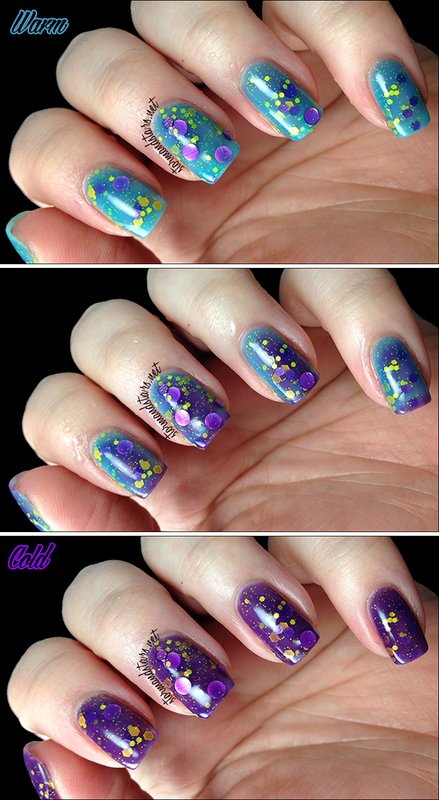 I did some very slight fishing for some of the larger glitters, but nothing that isn't expected. I do highly recommend turning these upside down for a few minutes before using so the glitters are closer to the top of the bottle. Are you ready for these? First up for this collection is Adrenaline. 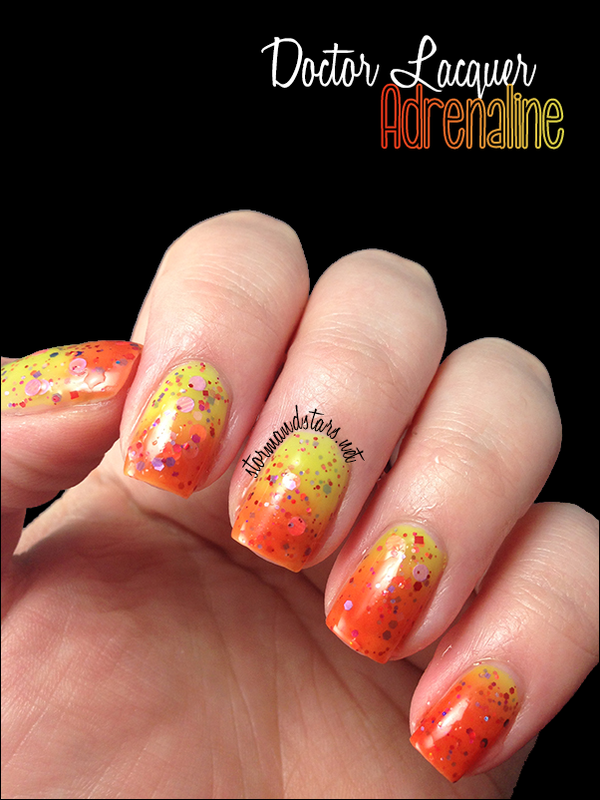 Adrenaline is a super bright yellow to orange thermal polish with lots of glitters. It starts out yellow in the bottle and turns a bright orange when it gets cold. I had a bit of a hard time getting this one to turn and stay cold, but you can see the transition below. I really love how this one looks half cold and half warm. You can see in the bottle shot above that it is in its warm state in the bottle. Next is one of my favorites from this collection. Here is Dopamine. 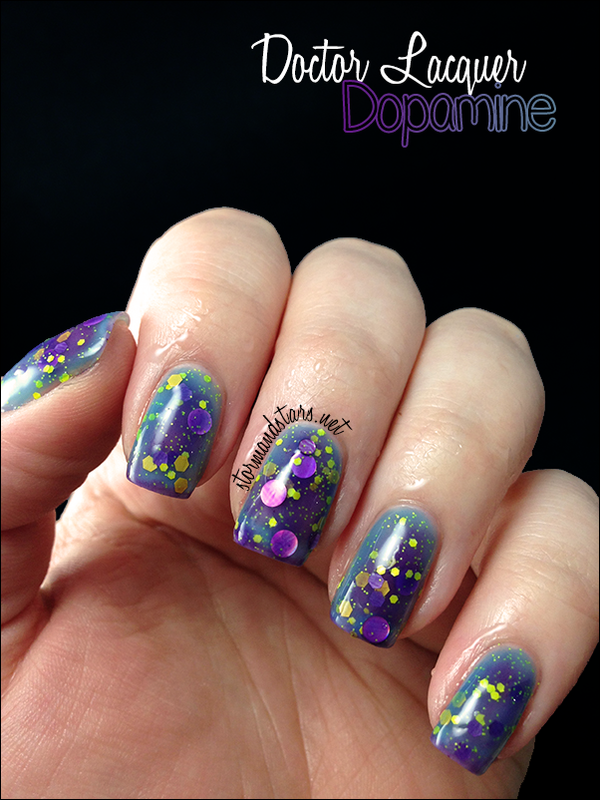 Dopamine is a lovely teal blue to deep purple thermal stuffed with yellow glitters of different sizes and two different sizes of metallic round purple glitter. You can see the full transition from warm to cold below. I love this both colors, but i really love it in its cold state. I am a sucker for darker purples like this and the yellow really pops! As you can see above, this lacquer starts in its cold state in the bottle and turns blue on the nail when you are warm. This next lacquer is called Estrogen. 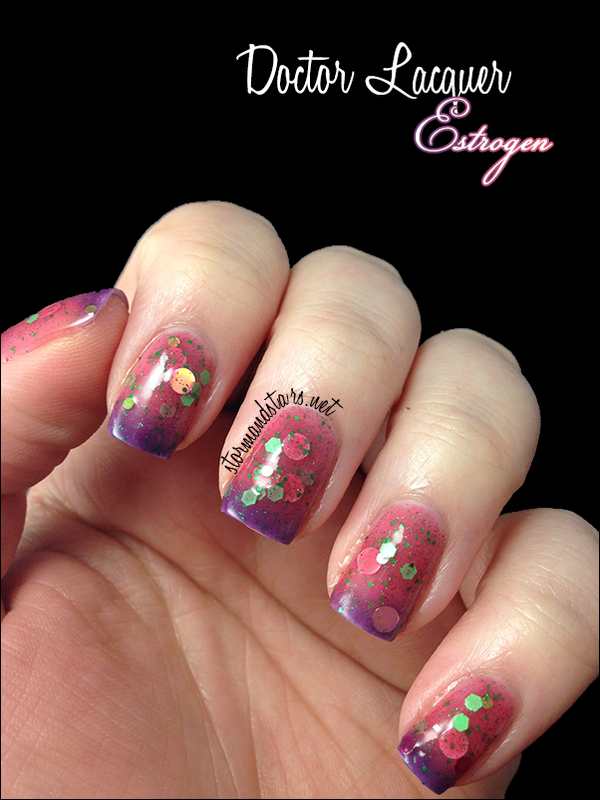 Estrogen is a dusty rose colored thermal lacquer which turns a dusty pink leaning purple when cold. It is full of green glitters and huge silver circles. 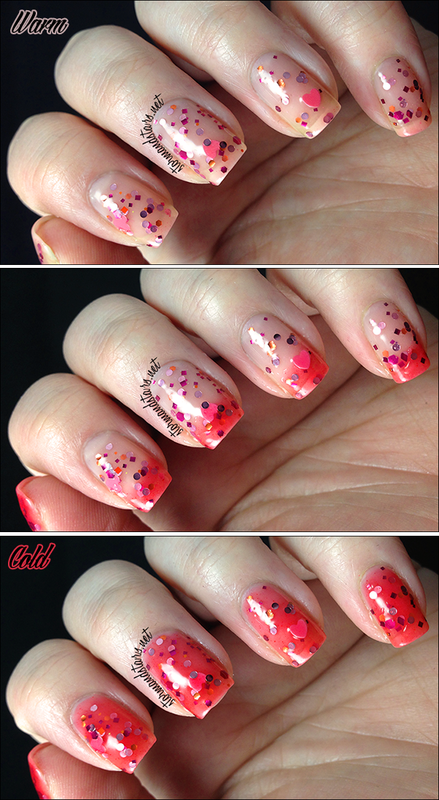 I believe there are also some smaller pink circles, but I didn't end up with any on the nail that I can see. Below you can see the transition from warm to cold. You can see that this lacquer starts out in it's warm state in the bottle and then turns purple in the cold. 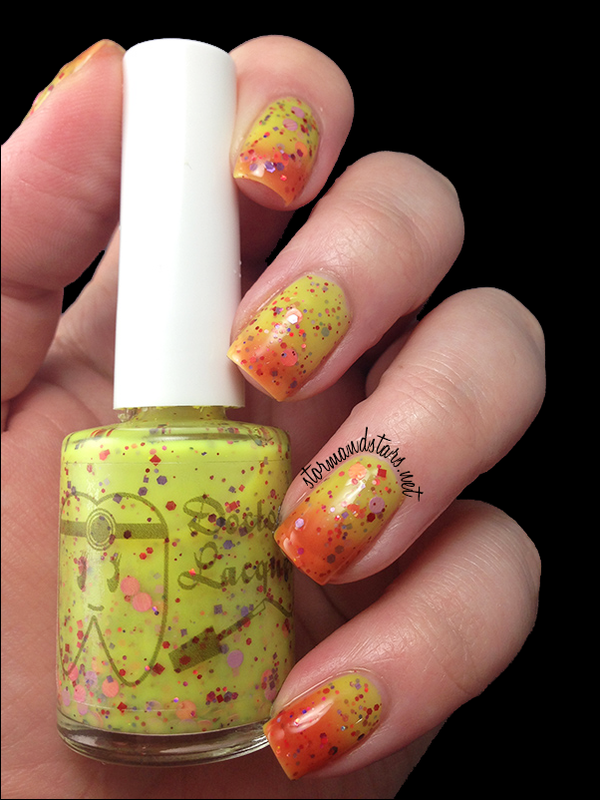 This lacquer is Oxytocin and is the only clear to colored thermal in this collection. Oxytocin is a bright pinkish red lacquer that turns clear on the nail when warm. 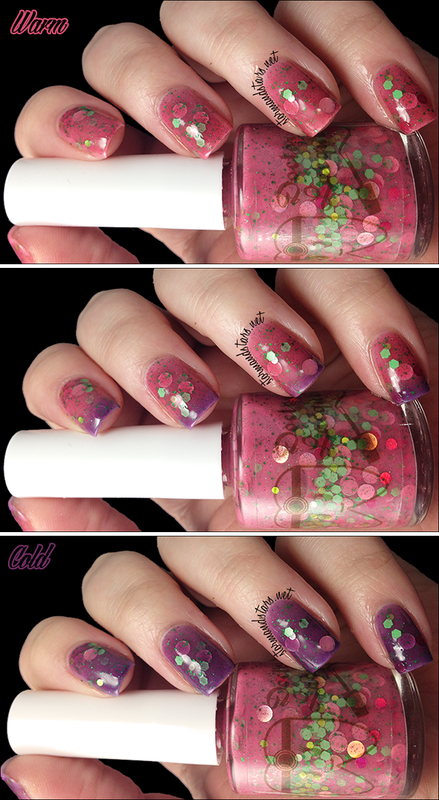 It is stuffed with shades of pink and purple glitter and pretty pink hearts. 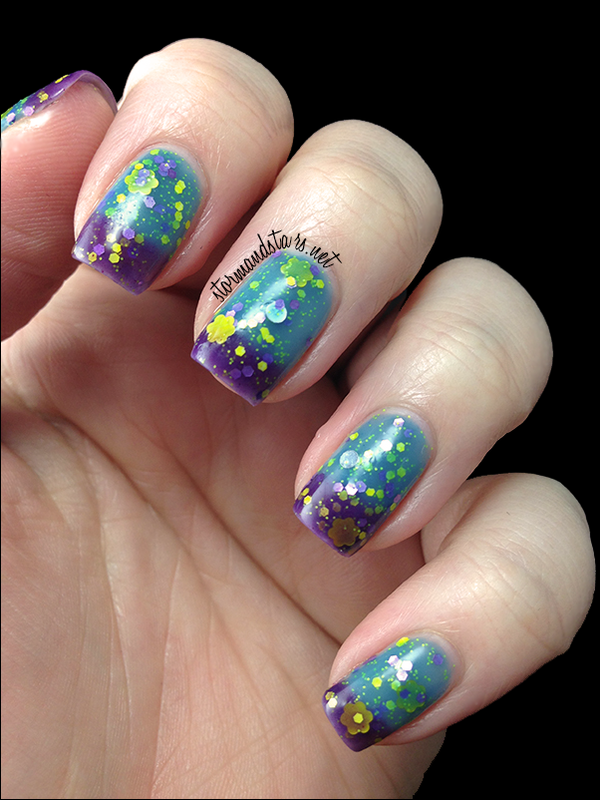 I didn't need to do any fishing for glitters in this lacquer. You can see the transition from warm to cold below. Oxytocin could be layered over so many different colors to have different results. I can't wait to play with it. 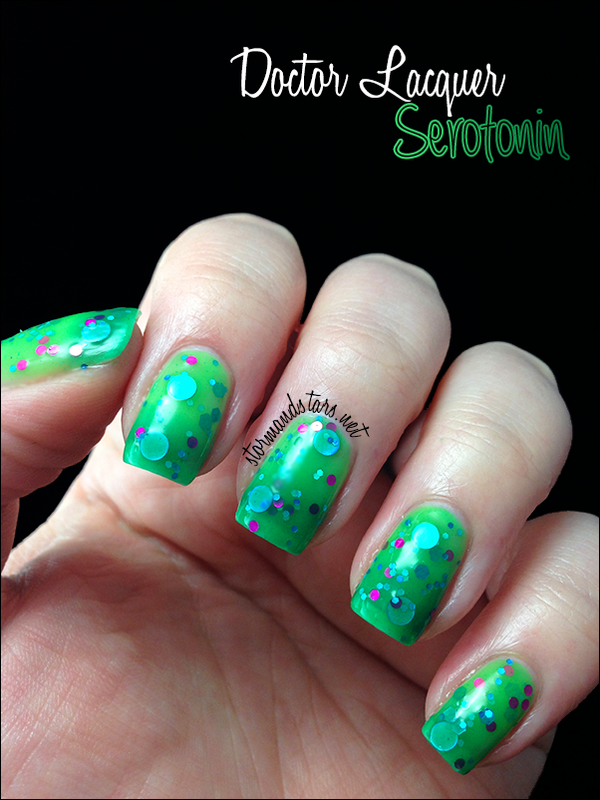 Serotonin is a green to green thermal lacquer. It starts out a darker green shade and turns an almost neon lime green when warm. The difference is colors is much more obvious in person that it shows in the photos, though you can easily see the difference between the warm and cold photos below. I love this one a lot more than I thought I would, especially the magenta circles that give it a great pop of another color. You can see in the bottle above that this one starts out in its cold state in the bottle and then turns warm when exposed to your body temp or warm water. Last up is my favorite of this bunch. This is Testosterone. Testosterone is a teal blue to deep purple thermal with yellow hexes, medium silver circles and big beautiful yellow flowers. I love the addition of the flowers to this baby. You can see the full transition from warm to cold below. I am soooooo in love with this! I've been eyeing it since the first time I say Angelyn wearing it in a photo before it was released and I am so happy to have it finally. Testosterone starts a bluish color in the bottle and turns purple when exposed to cold temperatures. I really hope you liked this collection as much as I did! There weren't any that I didn't like, but my favorites are definitely Testosterone, Dopamine and Serotonin. Which were your favorites? These lacquers are all available at www.doctorlacquer.com for $8.99 per bottle or discounted for the entire collection. This is a really great price for thermal polish! 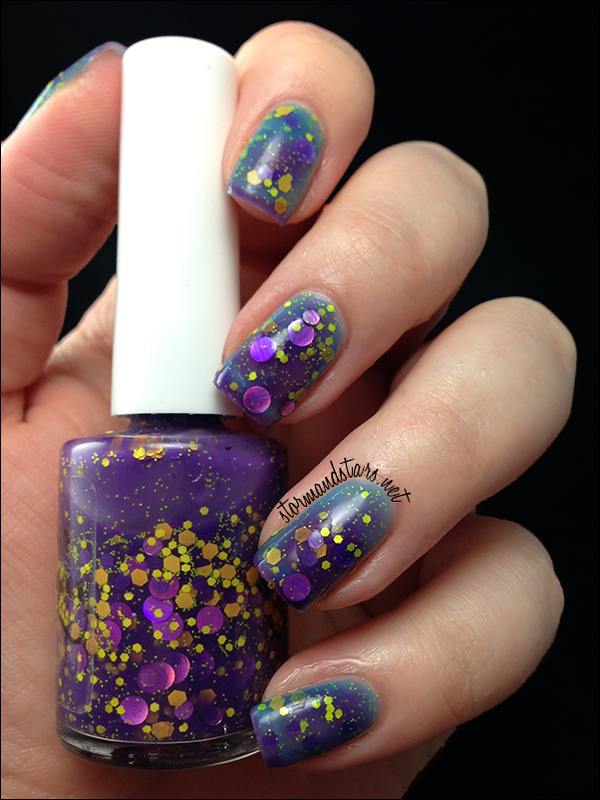 You can also follow Doctor Lacquer on Instagram and Facebook for news and updates! I love these!!! I'm such a science dork so I love all the names. Plus the polishes are gorgeous!